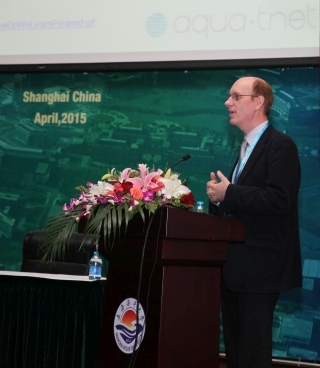 John Bostock presented the AQUA-TNET project at the recent Second International Symposium on Aquaculture and Fisheries Education (ISAFE2) in Shanghai, China (22-24 April 2015), reflecting on some of the lessons learned coordinating the project for 3 years. Slides from the presentation are available via Slideshare. The potential for stronger links between Asian and European programmes and initiatives was particularly stressed, with innovation being a key means of mobilising funding support. A selection of interviews recorded by Clive Dove at the Aqua-tnet Digital Teaching Skills Workshop held in Malta in June 2014 is now available on the workshop page, and for your convenience - right here! Aqua-tnet partners have been busy working on a set of articles to be published in a special edition of Aquaculture International (Springer). As these are finalised they are being made available as "Online First" articles on the SpringerLink website. The retrospective video on the Aqua-tnet project that was produced for the 2014 Annual Meeting is now available on the Aqua-tnet YouTube site. A series of more forward looking interviews with Aqua-tnet members have also been posted together with the opening presentation on aquaculture in Malta. The materials from the two-day Digital skills workshop (24-25th June) are now available via the link. Please also use our Facebook Group, the Twitter hashtag #aquatnet, and the Diigo Aqua-tnet group to stay in touch with latest updates, links and discussions. The final programme for the Annual Meeting on 26-27th June in Malta has now been published and information made available on the preceding two-day digital skills workshop (24-25th June). Please also use our Facebook Group and the Twitter hashtag #aquatnet, to stay in touch with latest updates and discussions. 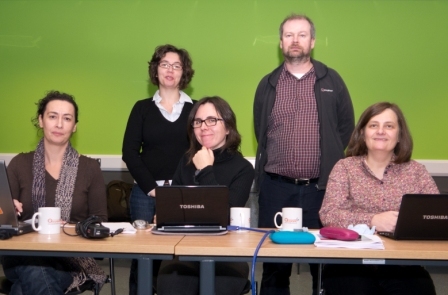 Members of the Workpackage 1 working group met at the University of Stirling in Scotland over the 25th and 26th of March 2014. 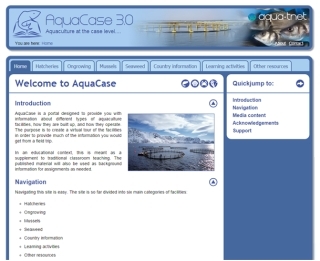 The main aim was to design a course on European aquaculture that uses the resources developed on the Aquacase website and facilitates collaboration between Aqua-tnet member institutions. The course will also enable lifelong learners with an interest in aquaculture but no formal background to participate. 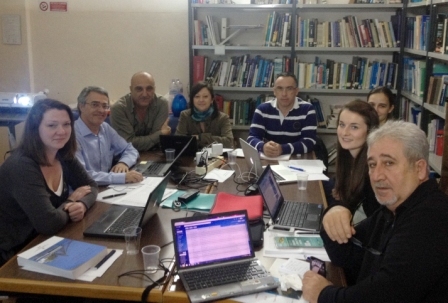 A meeting of the Aqua-tnet Steering Committee took place on 13-14th January 2014 in Amsterdam. Agenda topics included progress on project deliverables, plans for the annual meeting scheduled for June 2014, and strategies for ensuring the sustainability of the network and activities beyond the current EU LLP Erasmus funding. The first call in the new EU lifelong learning programme "Erasmus+" has been launched. From the Erasmus+ website: "Erasmus+ aims at boosting skills and employability, and modernising Education, Training and Youth work. The seven year programme will have a budget of €14.7 billion. This represents a 40% increase compared to current spending levels and shows the EU's commitment to investing in these areas. Erasmus+ will provide opportunities for over 4 million Europeans to study, train, gain work experience and volunteer abroad. In addition to providing grants for individuals, Erasmus+ will support transnational partnerships among Education, Training and Youth institutions and organisations to foster cooperation and bridge the worlds of Education and work in order to tackle the skills gaps we are facing in Europe. Erasmus+ brings together seven existing EU programmes in the fields of Education, Training and Youth; it will for the first time provide support for Sport. As an integrated programme, Erasmus+ offers more opportunities for cooperation across the Education, Training and Youth sectors and is easier to access than its predecessors, with simplified funding rules." 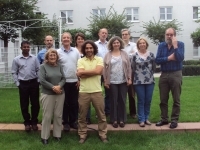 Members of the working group on innovation in lifelong learning (workpackage 5) met at the NH Airport Hotel in Frankfurt on 16-17th September 2013 to drive forward plans for project workshops and publications. They were also joined by representatives from workpackages 1, 2 and 6 to work on cross-workpackage issues such as the use of innovative learning approaches in PhD level training. 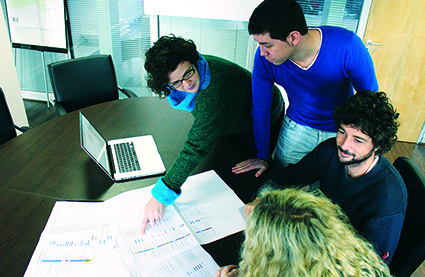 Aqua TT is running a short course on managing research projects from 22nd to 24th October 2013 in Dublin, Ireland. This practical three-day training workshop provides participants with (i) an understanding of the lifecycle of EC-funded research projects, (ii) a skillset to increase their ability to efficiently project manage their work, and (iii) the opportunity to apply these skills to real issues that occur in research projects. There is now an Aqua-tnet page on the Scoop.it! news site. This mixes updates about the project with relevant items on aquaculture, education and training from around the web. There is also a facility for anyone with a Scoop.it! account to add comments to any article. If you find our monthly newsletters too infrequent and don't like using Facebook, this could be the service for you! At Aquaculture Europe 2013, the work and achievements of Aqua-tnet were clearly visible as there were 2 oral presentations on Aqua-tnet. WP1 leader Odd Ivar Lekang presented ‘AQUACASE 3.0 – an innovative way to create interaction between academia and the industry’ during the Interact special session. WP7 leader Marieke Reuver presented ‘Aqua-tnet: networking, innovation and aspiration’, at the Communication & Transfer session. Previously the EAS Student Group hosted a student workshop featuring an introduction to Aqua-tnet and presentations by Magdolna Trenovszki (WP6), Marieke Reuver (WP7), Michael Moulton (WP1) and Margaret Eleftheriou (WP5). In addition to these presentations and special sessions, AquaTT maintained a dissemination table at AE2013 receiving many visitors. 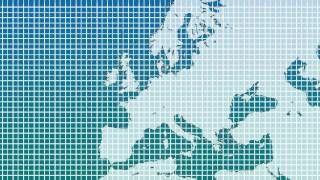 The European Aquaculture Technology and Innovation Platform has now been officially recognised as a European Technology Platform as a forum for developing strategic research and innovation plans for public and private sector support. The fifth EATIP Annual General Meeting took place from 10-11th September 2013 in Brussels including a presentation on Aqua-tnet and a presentation on ESCO. Further details from the EATIP website. European Parliament publish draft report on "Rethinking Education"
FEAP has published its 2012 annual report. 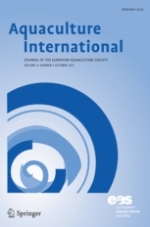 As last year this edition also gives a comprehensive overview of European fish farming and the issues affecting its development. Several case studies provide reference points, showing how the sector can react and develop. 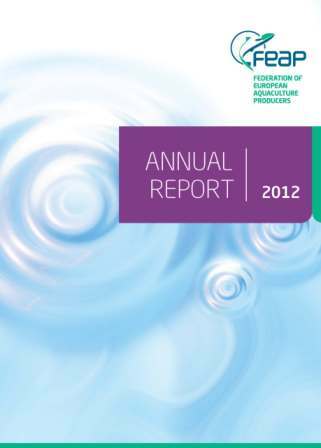 The report highlights different issues that reflect the needs and concerns of the profession, combining technical, legislative and strategic topics, each of which affects how European fish farming can develop in the most sustainable way, including economic, environmental and social considerations. YouTube has become the most popular platform for sharing video and there is now a wealth of resources that are valuable for learners including many in our field of aquaculture, fisheries and aquatic resources management. The Aqua-tnet channel on YouTube has a growing number of playlists that should be of interest to both students and teachers. If you have video material on YouTube that you would like to see featured in this way, please send us a link via the "Contact Us" menu item at the top of this page. A new Academic Journal Links page has been added to the site with the aim of making research as accessible as possible for learners of all ages. You can click through to individual journals to see tables of content for current and past issues and read open access articles directly (or others if your organisation has a subscription). You are also encouraged to make use of RSS feeds so that you are alerted to the latest content through your browser or e-mail client. The Aqua-tnet project was presented at the Learning Innovations & Quality Conference in Rome on 17th May 2013 by John Bostock (Coordinator). The presentation slides are available via SlideShare. The Aqua-tnet Annual Event 2013 was successfully held and presentations are now available on the event page via the link above. Aqua-tnet was represented at the AQUA2012 event, which was held in Prague from 1-5 September 2012. The abstract "Aqua-tnet: taking European education to the next level" had been accepted for an oral presentation, and was presented by Marieke Reuver at the "Education, Extension, and Technology Transfer" session. Aqua-tnet coordinator John Bostock gave a presentation on "The aquaculture knowledge economy: boom or bust?" at that same session. The EAS-Student Group held a workshop on Student Professionalism and Development. More information can be found on their website. If you are a Facebook addict, or just an occasional user, you can keep up with the latest events, discussions and photos about aqua-tnet in our new Aqua-tnet Facebook Group. You will need to join the group to see the posts and add your own updates. As a way of enabling broader and deeper discussion on topics relevant to Aqua-tnet members we have launched a Blog page where members are welcome to raise a topic for debate or give a personal view (Link also in top menu bar). 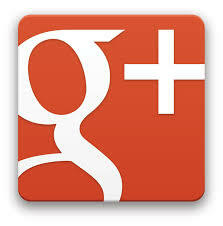 The page has links to the internal Discussion Forum, and also to a new Aqua-tnet Discussion Group on LinkedIn. To access the latter you will need to have a LinkedIn account and will need to apply to join the group. We look forward to seeing you there. Information on candidates interests and contact details will be made available at http://www.aquatnet.com/index.php/167/internships/.